You spend a lot of time in your office space, so the state it’s kept is bound to have a huge impact on how you work. When your area is cluttered and disorganized it can distract you, taking precious time away from the work you have to do and creating a tense, anxious environment. Keeping your workspace clean is a highly important, and often often overlooked, element of professionalism, but it’s often one of the most ignored chores. 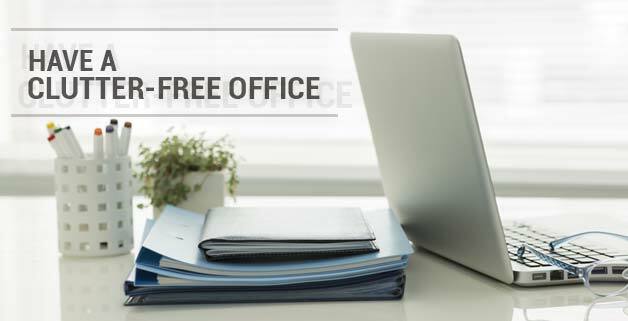 Here are some tips on how to organize your workspace to look cleaner and to help you feel better! First of all, start from scratch. Clear your desk off completely and only let things you regularly use rest on the surface. Put everything else in a drawer to sort through later. This will help to clear you mind and let you focus on what’s really important in your office. Then, re-evaluate what you can get rid of. If you don’t need those scraps of paper, dried out pens, or old receipts, throw them away! Then organize your desk based on level of importance. The things you use Things you use on an almost-daily basis should go in the closest drawer to you, and the things you use the least can be tucked away in an extra cabinet or drawer away from your desk. Think efficiency: you want to be able to grab what you need as soon as possible so as not to waste time without taking up unnecessary space. Sometimes just re-organizing will help to create space you didn’t know you had. If you want a bit more storage but have run out of ground space to work with, start thinking vertically! Build shelves on the wall behind your computer to store reference books, files, and folders. Creating more open space around your desk will make your area look larger, creating a more organized look. If you don’t have much space to work with, there are ways to work around that! Rising your monitor a few inches off your desk and adding mirrors will give the illusion of more space. This will increase the light in the room and create a more open atmosphere. Finally, everything in your office should have a place where it belongs. If it doesn’t, create one! You can add a magnetic strip under your desk to attach paper clips or use the space behind your desk to organize extra cables. Putting everything back in its place when you leave work will ensure that when you come in the next morning you will feel calm, refreshed, and relaxed. A few simple steps like these will make all the difference in your workplace environment!